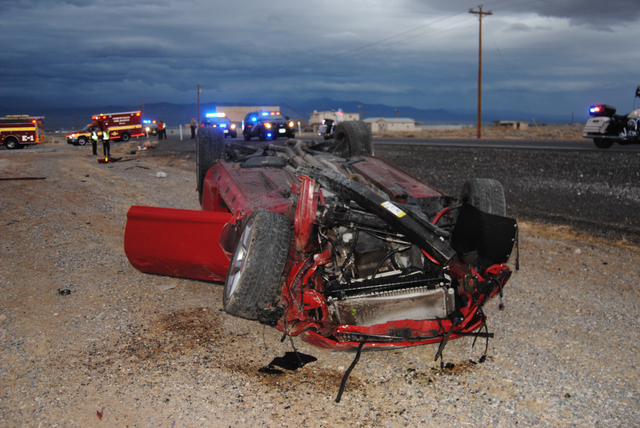 As today marks the first day of winter, Pahrump Valley Fire and Rescue Chief Scott Lewis is reminding valley motorists to be aware of road hazards along Highway 160. The hazards, Lewis said, are wild horses and burros making their annual winter pilgrimage from the mountains and foothills down to the valley floor seeking milder temperatures. That action became apparent to one area resident last Wednesday evening along north Highway 160 near Country Place Road when the driver struck two burros walking in the travel lanes just after sunset. Lewis provided a few safety tips for drivers who regularly use that stretch of highway each week. Additionally, Lewis said that drivers need to be extremely careful by lowering their speed and avoid overdriving their headlights. Last Thursday, Dec. 15, fire crews responded to Highway 372 near Bannavitch Street for a single-vehicle crash just before 4 p.m.
Lewis also said those who witness a crash should use caution while tending to the patient(s). The driver, who was conscious following the crash, is expected to recover from their injuries. The following morning, fire crews were in the right place at the right time while transporting a patient to a Las Vegas hospital from Pahrump. Lewis also noted that during a period on Saturday, between the hours of 2:13 p.m. and 5:57 p.m., fire crews were dispatched and responded to at least four motor vehicle collisions throughout the valley, occurring almost one after the other. On Sunday, fire crews were summoned to a structure fire just before 5 a.m. Upon arrival, Lewis said crews found a fire condition, as reported. “There was smoke showing from the eaves and the door frames,” he said. Lewis said the cause of that fire appeared to be accidental in nature. On Monday, Dec. 19, fire crews were dispatched for another reported structure fire on the 4100 block of East Norway Street. 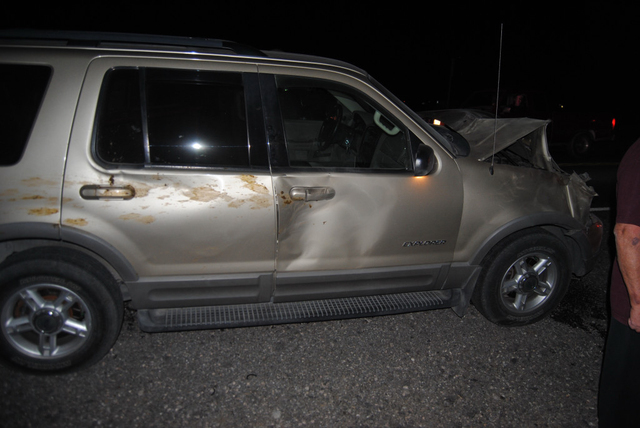 Three people were hospitalized Friday morning after a head-on crash on Blue Diamond Road near Mountain Springs. Two pickup trucks collided just before 10 a.m. in a southbound lane near mile marker 19, according to Nevada Highway Patrol Trooper Jason Buratczuk. Buratczuk said three people were taken to a hospital, but he did not know the extent of their injuries. Lanes of Blue Diamond Road, also known as State Route 160, were closed following the crash but were reopened about 12:30 p.m. The Nevada Department of Transportation said the crash was outside the $16.5 million widening project. The work is expanding SR-160 in Clark County from Red Rock Canyon Road to mile marker 16.63 from two lanes to four lanes.